And that’s really what this is: quick objective flashes of reporting from all over Chicago accompanied by some pleasant illustrations which help flesh out the moments. Each little slice is documenting and, taken as a whole, it is a form of reportage. But there lacks a cohesive theme to the collection (other than everything happens in Chicago) and the artwork, while nice, is illustrative only. It does little in the way of enhancing the narrative other than providing a snapshot of the experience. Because of this I am not sure about the use of the term “comics Journalism” – to me this seems more “illustrated” journalism. What Joe Sacco does is along the same lines, but at least in his books there are often times when he lets his art tell the story, or his panels work sequentially to express time and action. This does not happen in The Illustrated Press: Chicago. 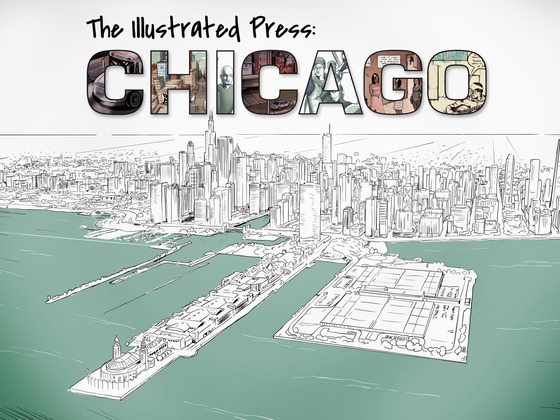 While I enjoyed what Holliday and Rodriguez have put together in this package - it’s nice, it’s informative, it gets its job done - unless you have a strong interest in the life of Chicago’s underserved populations, I would have a hard time really pushing you to buy this book. Still, there is potential here, and I look forward to seeing what these gentlemen come up with next.